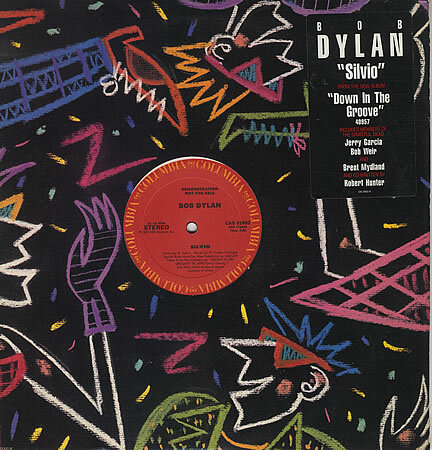 “Silvio” marked Dylan’s return to the pop charts in 1988. The song, co-written with The Grateful Dead’s Robert Hunter, peaked at #5. It was the only single off the album Down in the Groove. I recall that it further cemented my growing break with Dylan. Down in the Groove was released at the end of May 1988. I graduated from high school in June of that year. I dutifully bought Down in the Groove, and found it even more lacking than Knocked Out Loaded (nothing even close to the quality of “Brownsville Girl”). I was pretty out of touch with top forty music at the time, but I was aware that “Silvio” was receiving air play. I had no idea that it was as popular as it was until Wikipedia told me so. is pretty much the only thing that I ever recalled from the song. Even today I didn’t really know any of the lyrics to the verses – they seemed somewhat irrelevant, and they pretty much still do today. I do recall dismissing this song as sub-standard Dylan partly because it was co-authored with Hunter. I was pretty anti-Grateful Dead at this point in my life, and so I felt the song was contaminated by their involvement with it, which is, of course, utterly nonsensical in retrospect. My attitude was that Dylan didn’t need to be co-writing with inferior talents, which is also bizarre because my favourite Dylan song was co-authored with Sam Shepard, and my favourite album that year was Desire, which is mostly co-written songs. Consistency was not the hallmark of my high school years. Dylan is clearly a fan of this song. He has played it live 594 times. It entered the repertoire in 1988 and it really didn’t leave for a long time. Bjorner even found it noteworthy to mention concerts where it wasn’t played over the following decades.